Many kinds of lower back pain can be as a result of many different types of conditions. From a sudden sharp pain that can make it almost impossible to move to a dull ache that has lasted for years, back pain is a condition that many people neglect until it strikes. The staff at Magnolia Wellness Center, Tallahassee, wish to inform you about six types of back pain. Straining the back muscles can cause them to contract involuntarily or spasm. Common causes of back spasms include sleeping in an awkward position, bending too fast, or heavy lifting. Trigger points are tight areas in muscles that can transmit pain to other body areas. When pressure is applied to trigger points, they can cause pain to the legs, neck, and feet. Osteoarthritis is a condition that involves the breakdown of bone and cartilage in the body. When it affects the spine, it causes pain in the back, legs, and buttocks. Ligaments are tissue fibers that link bone to bone. If one ligament becomes strained at the back, it can cause pain in the strained region, legs, and feet. Spinal discs form a cushion in the vertebrae and protect them from impact and other forces. 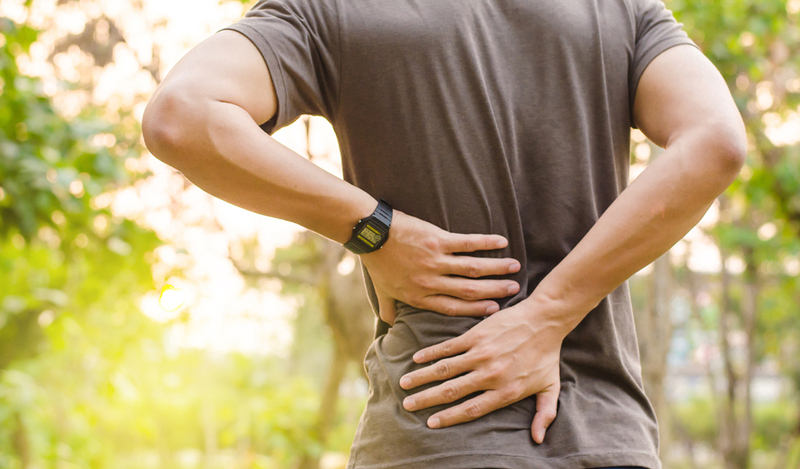 It is not uncommon for discs to slip, and this causes the discs to protrude from the spinal column and apply pressure to the nerves that that connect the spinal cord and the legs. Slipped or herniated discs can cause numbness, pain, and other kinds of discomfort. Spinal stenosis occurs when the space in the spinal cavity that contains the spinal cord and nerves is tightened or compressed, exerting pressure on the nerves that can culminate in pain in your back and legs. Thickened ligaments, bone overgrowth, tumors, and herniated discs can cause spinal stenosis. Whiplash is a kind of pain that is caused when your head suddenly whips forward then backward and can be transmitted to your back. Often, whiplash is caused by motor accidents, especially when you are hit from behind. The most prevalent causes of upper back pain include strain and back structures problems. Strained ligaments and muscles can often cause chronic back pain. Often, strain occurs with sudden awkward movements and incorrect lifting of heavy objects. Over-activity can also cause strain. A good example is the sore feeling that occurs after a few hours of playing sports or yard work. Vertebrae consist of interlocking bones that are stacked on top of one other, and they form the spine. Discs are tissues that are located between each vertebra. Injured discs are a prevalent cause of back pain. Skeletal abnormalities can also cause chronic pain. This includes the narrowing of the spinal canal caused by arthritis or scoliosis. Our chiropractor in Tallahassee; lower back pain treatment professional may recommend to you manual manipulation and spinal manipulation to relieve back pain symptoms. Manual manipulation is a short-lever, high-velocity arm thrust applied to the aberrant vertebra to diminish nerve irritability, restoring the back's motion range, improving functionality, and reducing nerve irritability. This is commonly referred to as chiropractic adjustment. Mobilization is low-velocity stretching, manipulation, and movement, of the muscles and joints with the aim of increasing the motion range of these areas. At Magnolia Wellness Center, we are committed to your health, and we cater to patients in Tallahassee and the surrounding areas. If you or your loved ones suffer from back pain, call us at (850) 656-6606 to speak to our specialists.